A.R. Baumann began writing as a child and became fascinated with the intricacies of people through her extensive world traveling. Her first award winning short film, Lorean, was screened at the Modern Museum of Art in NYC. Her second film, What’s Next, won the finalist award at the Houston International Film Festival. Baumann’s first published novel, Under A Cloud of Rain, features her protagonist, Nick Noelle. 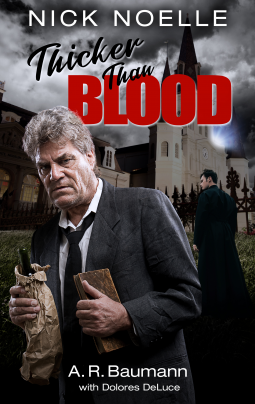 Thicker Than Blood is the second published novel in the continuing saga of Nick Noelle. A good thriller, engaging and entertaining. I like the main character, the grippy plot and had to read this book in a sitting.